Back when I was working at my last job, a colleague, who happened to be my work bestie, introduced me to this treat. We'd take our breaks together whenever we could and hop over to Muffin Break. Our Muffin Break outlet made the best Spinach and Feta Rolls (sidenote - their Bran muffins were to die for). But I'd never noticed these little beauties before this. I was on a first name basis with its Non-vegetarian counterpart - the sausage roll. I've had quite a few of those. But on this particular day, when we went over to Muffin Break, she ordered a Spinach and Feta Roll to go with her coffee. Needless, to say, I was intrigued. So I ordered one for myself too. And the rest, as they say, is history. From that day on, if I ever need to grab a bite and am in the mood for something savory, I pick up one of their Spinach and Feta Rolls. They are seriously good. And, I like to think that I'm getting a little extra Spinach in my diet that day. So getting back to yesterday. When I found myself with a big basket of Ricotta cheese and a bag of Spinach I needed to use up, I decided to see if I could use the two together and come up with something delicious. After a little looking around, I found just the thing. I've based my rolls on a similar recipe I found online and I just switched it up to my liking. This time around, I used store bought Puff pastry. I had a packet in the freezer that I wanted to use up too. This recipe has just 2 basic components - the pastry and the filling. The filling is really easy to put together. You just mix up all the ingredients and your ready to go. The verdict - These rolls are really good. They're not exactly like the Muffin Break ones. I am now convinced that there is some flour added to their filling, possibly to bulk it up. But these homemade rolls can give them a serious run for their money. And this time, I know for sure that there's a heap of spinach in there. And everyone knows that Spinach with Ricotta and Feta is a match made in heaven. 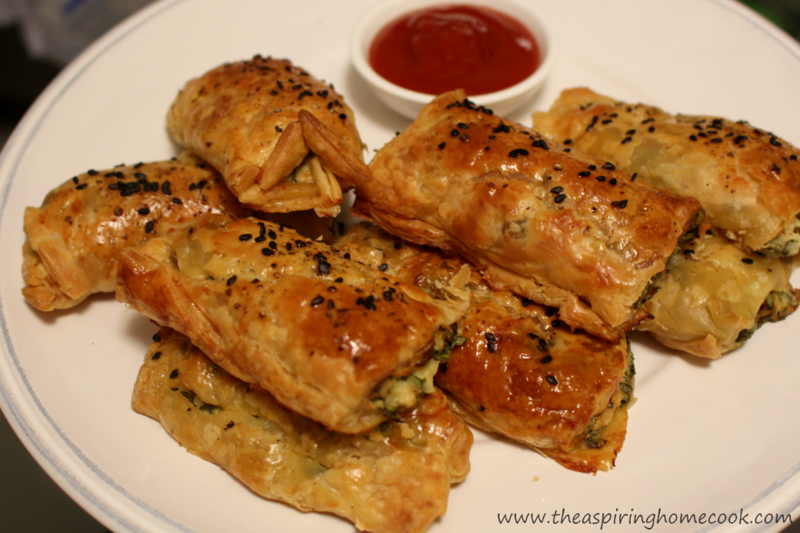 So let's have a look at these Spinach Rolls, shall we? Place the baking tray in the oven. Thaw 3 sheets of puff pastry. The pastry should be soft enough to work with but still cold. If it warms up too much, it gets sticky and difficult to work with. Crumble the feta into a bowl. Now add the Ricotta and crumble that in as well. Add crushed black pepper to taste. Taste the mix and add more salt if you want. I didn't need to add any salt at this stage. Add the spinach and red chili flakes. Mix well. Crack the egg into a small bowl. Whisk and keep aside. Working with one sheet at a time, cut the sheet in half. Spoon the mix to form a long log in the center of each half of the pastry (lengthwise). Brush one side (along the length) of each half of the sheet with the whisked egg. Roll the other side of pastry over the spinach into a tight log. The egg will help seal the pastry. Place the rolls on greaseproof paper, seam side down. Repeat with the rest of the pastry. Carefully place the paper onto the heated tray. Brush the tops of the rolls with the whisked egg (egg wash). Crack some black pepper on the top of each roll and sprinkle some black sesame seeds on the rolls. Bake for about 30 minutes or till golden brown in color.